The Britannia is the largest ship built just for a British market - with 10 dining venues of top culinary standard, 10 relaxation spots to help you unwind on holiday, 7 entertainment venues to keep you stimulated and 8 bars and social hubs to get to know your fellow passengers, you won’t find yourself lacking diversion. The Britannia is the flagship of P&O’s fleet and the epitome of style and glamour. Although she was inspired by times past, she has truly been designed for the future. Conceptualised by leading interior design experts, the ship is a must-see for cruising newbies and sea veterans alike, from port to starboard - especially the stunning atrium. From inside cabins to palatial suites, there’s a cabin for every budget and taste. Whatever cabin you choose, it will be air-conditioned and spacious, suited to helping you unwind at sea. Many of these rooms open out onto balconies to give you a panoramic ocean view. All accommodation features cotton sheets, tea and coffee making amenities, refrigerator, hairdryer, safe for your valuables, in-cabin television and capacious en-suite bathrooms with toiletries pack. Not to mention you will be looked after for the duration of your trip by your own personal cabin steward, and you may order room service from dawn until late evening at no extra cost. The Britannia offers a startlingly large variety of dining options. Whether it’s Freedom dining at the Meridian, Peninsular or Oriental, or casual dining at the Horizon, the Lido Grill or any of the other numerous daytime options, you’ll be catered to day and night. If you’re in the mood for a bit of indulgence, there’s the chance to visit the Select Dining venues of Sindhu; The Epicurean, where a range of British classics has been curated by top chefs (also does a lovely high tea); the Market House, a delightful French-style pâtisserie from Eric Lanlard; and The Glass House, a wine bar and restaurant created alongside award-winning wine expert Olly Smith. As for drinking, tea and coffee are available around the clock, and you can always grab a drink at the glamorous Crow’s Nest, elegant Blue Bar or a casual pint at Brodie’s Bar, who stock an astonishing range of British beers, ales and ciders. Britannia boasts Britain’s largest art collection at sea, of over 6,000 artworks. 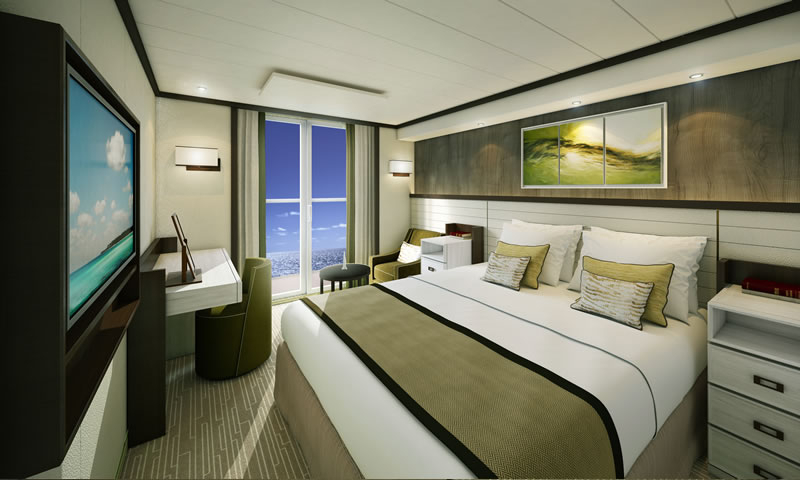 Enhancing the ship’s interior design, the works were hand chosen to add to the cruise’s 5 star hotel ambience. Pieces ranging from bronze to paint to ceramics are on show, many by British artists but some by global artists from Japan, Australia and South Africa. Take in the culture simply by wandering around. The Limelight Club is a venue exclusively for adults that combines excellent food with sensational entertainment, for an unforgettable night. Comedians, musicians and actors come together to bring you dazzling performances. For foodies, The Cookery Club is a brand new addition, that will have you learning new recipes in a series of inspiring classes taught by the Cookery Team onboard. Welcoming beginners, intermediates and experts alike, everyone can hone existing skills and pick up valuable new ones - not to mention Bake-off level presentation to top it all off. De-stress on the on-board spa, be utterly pampered in the hair and beauty salon, or sweat it out in the sauna or steam room. And for an extra indulgent pleasure, the Retreat is an alfresco spa terrace, exclusively for adults, that caters to those wanting to unwind and bask in nature’s beauty beneath an exotic cabana. With activities including yoga, fitness classes and dance sessions, getting in shape can be social and fun as well as healthy - but don’t worry, there’s also a gym for those of you who prefer to go it solo. Welcome, families - Britannia offers the perfect balance, bringing the opportunity to enjoy quality family time together, as well as some adult time while your kids enjoy activities, meet new friends and have adventures. Family cabins have upper berths like bunk beds or sofa beds, and during the day your children can enjoy age-specific clubs (ages 2-17 covered) including entertainment such as treasure hunts, craft sessions, parties, discos and sporting competitions. Family mealtimes are hassle-free on the Britannia and family excursions are an option at every port. The pools have a “splash zone” for younger children and a teens’ sun deck for older kids. So sit back, relax and let the fun commence. Two lower beds convertible to a king-size bed. Bathroom with shower over bath or shower only, WC and mirror. When three or four guests share a cabin with upper berths, the two lower berths cannot be pushed together for safety reasons. Fully air-conditioned balcony cabins enjoy two lower beds convertible to king-size bed. Bathrooms boast a bath with shower or shower, sink, and WC. There is a chair and table, a flat screen TV, plus radio and telephone, writing desk, refrigerator and tea/coffee making facilities. There is also a safe. Floor to ceiling sliding glass doors lead to your balcony with recliner chairs and table. Plus mineral water and pamper pack on arrival. Fully air-conditioned balcony cabins enjoy two lower beds convertible to king-size bed. Bathrooms boast a bath with shower or shower, sink, and WC. Additionally there is an iron & ironing board, trouser press and a hairdryer. There is a sitting area with sofa, chair and table, two flat screen interactive TVs, plus radio and telephone, writing desk, refrigerator and tea/coffee making facilities. There is also a safe. Floor to ceiling sliding glass doors lead to your balcony with recliner chairs and table. Balcony cabins have an atlas and binoculars, plus mineral water and luxurious pamper pack on arrival. Fully air-conditioned suites enjoy a separate bedroom with two lower beds convertible to king-size bed. Bathrooms boast a whirlpool bath, shower and WC plus luxurious premier pamper pack, bathrobe & slippers. Additionally there is a useful walk-in dressing area with trouser press and a hairdryer. The lounge has a sofa & armchairs plus dining table and chairs, with a mini stereo and two flat panel, interactive TVs plus radio and telephone, writing desk, refrigerator and tea/coffee making facilities. There is also a safe. Floor to ceiling sliding glass doors lead to your balcony with loungers, chairs and table. Suites have a butler service, magazine and newspaper selection, atlas and binoculars, plus fruit bowl, mineral water, flowers, champagne and chocolates on arrival and daily canapés.